A military transport plane is seen below and on the starboard side from Air Force One while in flight from Palm Beach International Airport, Florida, to Andrews Air Force Base, Maryland, April 9, 2017. A U.S. military plane appeared to come unusually close to Air Force One moments before the jet carrying President Donald Trump landed at Joint Base Andrews on Sunday. The sighting aboard Air Force One of a C-17 Globemaster occurred at 6:23 p.m. (2223 UTC) as the presidential aircraft was descending into its home base located in the state of Maryland, just outside Washington. Air Force One took no evasive measures and there was no indication it was in any danger. The presidential flight landed without incident at Andrews six minutes later. President Donald Trump steps off Air Force One as he arrives April 9, 2017, at Andrews Air Force Base, Maryland. Several journalists, including a VOA correspondent aboard the flight witnessed the incident after being alerted by Associated Press staff photographer Alex Brandon who managed to snap a picture of the other plane after it approached at a slightly lower altitude from the north and veered off to the starboard (right) side of Air Force One. Those from the media who saw the other plane, including a television audio technician who has been flying on Air Force One since the Carter administration, agreed they had never witnessed such a close encounter aboard the presidential aircraft. “I would say beyond all doubt that this is a strange occurrence,” said a retired U.S. Air Force Lt. Colonel commenting on the incident, who was quoted by Strategic Sentinel, which specializes in geospatial intelligence. Air Force One is often given more separation by air traffic controllers beyond the typical 300 meters vertically or 4.8 kilometers horizontally spacing. No one on Sunday evening answered the 89th Airlift Wing public affairs duty officer line at Andrews. The wing includes the Presidential Airlift Group, which operates the VC-25 military plane, a military version of the Boeing 747, that has the call sign Air Force One when the president is aboard. No one answered the phone at Potomac Consolidated Terminal Radar Approach Control, which controls airspace over Andrews and more than four major commercial airports in the metropolitan region. 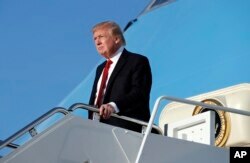 There was no immediate comment from the White House and it is unknown whether President Trump or any other senior officials aboard the flight from Florida's Palm Beach International Airport were made aware of the situation. Among others on the flight were the president's chief strategist Steve Bannon; adviser Stephen Miller, National Security Adviser H.R. McMaster and the White House deputy chief of staff for operations, Joe Hagin. Reporters in the press cabin quickly turned their attention back to the TV screens showing a live broadcast of the Masters golf tournament during the final minutes of the otherwise uneventful flight during which the president did not come to the back of the plane to speak to reporters. Trump was returning from a four-day stay at his Mar-a-Lago resort where he met with Chinese President Xi Jinping and ordered a missile strike against an airfield from where the Syrian air force had launched planes that allegedly dropped sarin nerve gas on civilians in rebel-held territory.